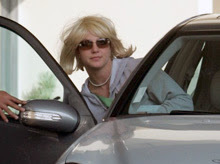 Look at this photo of Britney Spears that accompanied an online new story about her checking out of rehab. Doesn't she look like a male-to-female cross-dresser? Maybe it is the wig or the low-key makeup or the suit, but whatever… she looks like a trans-sister to me. Which got me thinking about other women who look like trans-sisters. I have nothing against women, who look like trans-sisters. They help us real trans-sisters to blend in society. They obfuscate the line between males and females, which makes it easier for real trans-sisters to pass. Yes, a lot of these women are drop-dead gorgeous and would never be mistaken for trans-sisters, but there are a few who might. Take 6-foot-tall actress Famke Janssen, for example. She played a man (a pre-op and later post-op trans-sexual) in the television series Nip/Tuck and was mistaken as a transvestite in the film Celebrity. Personally, I would never confuse her as a trans-sister, but evidently someone thought that her persona was such that they cast her in those trans-sister roles. Similarly, Rebecca Romijn plays a post-op trans-sexual on the television series Ugly Betty. I dunno, but maybe in Hollywood, just being tall qualifies you to act as a trans-sister. By the way, I have a pet peeve with Hollywood regarding the casting of trans-sisters on film and television. I hate it when a female is cast as a trans-sister. I think a male playing a trans-sister would be more realistic and lend credibility to the role.